DotA 6.79 Beta is now Available! While we already know the DotA 6.79 changelogs from the Dota 2 developers, we're still anxious about the Warcraft 3 version of DotA 6.79. 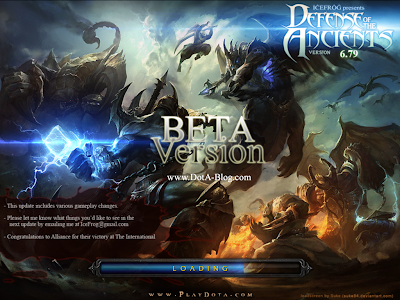 Many players are worried that IceFrog stop updating the Warcraft version of DotA. And today, we got a really great news from him. The DotA 6.79 is under development and IceFrog post a beta map in case you want to help finding a bug. Can't wait to try it? The official version is released! Check out the DotA 6.79 Official Map! Ah.. Can't wait to try the new (beta) map! If you found some problem and want to help IceFrog fixing the map, you can post the bug in this forum. PS: Don't want the beta map and prefer to wait the official map? Subscribe this blog or follow our Twitter, Facebook or Google Plus and we will let you know when DotA 6.79 is officially released! Spin Web Sfx not visible. It's like the old spin web model but very big that it is no longer visible.